Supported by expert employees, we are willingly engaged in the field of providing PHE Gaskets. We are stockiest and suppliers for all types of Gaskets and O Rings required in Ammonia PHE (Plate Heat Exchanger) Condensers and Chillers. Makes : ALFA LAVAL, GEA ECOFLEX, KELVION, SONDEX Etc. Model No. available : M10BW, LWC100T, LWC150T Etc. We are remarkable enterprise, involved in offering superior quality Plate Heat Exchanger Gaskets. We provide Plate Heat Exchanger Gaskets that are reliable and are known for its dimensional accuracy, sturdy construction, durability and application specific designs. We offer our products in various sizes and dimensions as per the needs of the clients. These plate heat exchanger gaskets are offered within the affordable rates of the client. 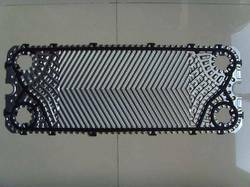 We are the leading manufacturer and supplier of Heat Exchanger Paraflow Plate Rubber Gasket. We are engaged in offering a qualitative range of Tranter Plate Heat Exchanger Gaskets. Our range of Tranter Plate Heat Exchanger Gaskets is widely appreciated by our clients which are situated all round the nation. Being a well-known entity, we are involved in presenting an extensive series of PHE Gaskets to fulfill the requirements of our customers. - the phe size in this range vary from 1 connection size to a maximum of 20 connection size. We have state-of-the-art manufacturing techniques to produce plate heat exchanger gaskets that are manufactured from finest quality polymers. These PHE gaskets, which have excellent stiffness and softness. Our PHE gaskets possess high elasticity and resist exterior shocks to provide good protection. To furnish the wide requirements of the customers, we are offering a high quality range of Plate Heat Exchanger Gasket.